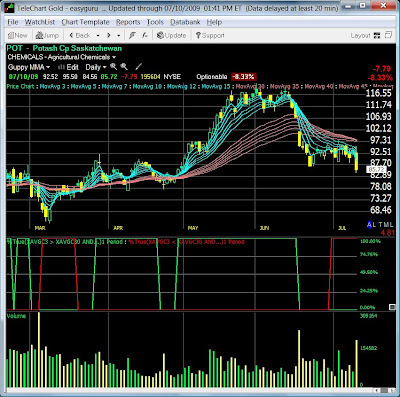 Daryl Guppy uses a set of two EMA's to guage a trend and strength of trend. MMA stands for Multiple Moving Averages. You can create a similar scan for downtrend. How can you use these scans to find market health? Look at % of stocks in uptrend and % of stocks in downtrend. As of yesterday 30.35% of stocks in Worden universe were in uptrend. As of yesterday 34.37% of stocks were in downtrend. On 12 the June 71.33% of stocks were in uptrend and only 10.84% in downtrend. In last one month there has been a sharp correction which is eflected in those breadth numbers. I love the Guppy view. Each week I review the daily guppy chart on my blog. I also look at the average slopes of the fast and slow moving averages as another means to judge market trends.